Our editors are skilled professionals in non-linear editing. We use the latest Final Cut Pro software and graphics tools to achieve the look that our clients want. Our editors are capable of visually communicating everything from a one-minute actor's demo to a theatrical feature film. Whether it be demo tapes, music videos, theatrical trailers, industrials, infomercials or long-form content we can provide a cost-effective, high-quality finished master. (1) Individual clips -- short samples from a single performance. Individual clips are ideal for many casting opportunities. EditPlus offers Aircheck in partnership with Breakdown Services to provide this service. (2) General Demos -- used to introduce your work to reps and casting who do not know the range of your work. The best length is from 3-1/2 to 5 minutes, with the focus on the client's performance. We believe in a classical approach to presenting your material and rarely recommend the use of montages or fancy "flash" -- the demo should feature YOU. Your demo should be constructed from the highest quality source material possible. Your advantage in working with us is that we maintain a digital aircheck library of nearly every episode of one-hour dramas and half-hour sitcoms. Our clients include Academy Award-winners, Emmy Award-winners and series regulars from most current network shows. (3) Custom Reels -- used to submit for casting opportunities when 3 or 4 examples from a client's body of work are the best material to send to casting. 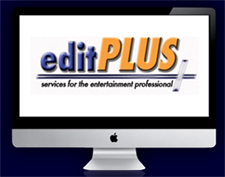 EditPlus provides a unique product, The Custom Reel, to give you a competitive advantage. Entertainment clients and their talent representatives may request airchecks of relevant programs for their professional use. We can record to mini-DV or DVD. Our modest pricing allows the client to use the highest quality source material available for the construction of their demo reel. We maintain a digital library consisting of nearly every episode of scripted dramas and comedies created for the network and major cable channels. Our library includes material from 1997 to the present and we can provide access for editing and delivery to industry locations, often the same day. Airchecks may be ordered directly from EditPlus or, for your convenience, from the Actors Access website here. Our reputation for having convenient access, quick turnaround and just about any title requested has many other producers, editors and agencies ordering their airchecks from us. Our staff is proficient in a variety of DVD authoring approaches. If you need a basic transfer, we can do direct-to-DVD recording, which features record times of up to 4 hours and basic menus. Our template-based DVD authoring is an affordable solution for our editing clients who want a more custom look at an affordable price. This level of DVD offers auto-play capability, motion menus and nested menu options with standard navigation features. For clients who wish a truly customized Red Book Standard DVD master, suitable for mass production glass mastering, we offer a high-end DVD authoring service, including custom motion menus. This service is individually-tailored to the client's project based on a personal consultation. Our clients rely on us for affordable duplication of their material to DVD. Our DVD duplication is recorded to DVD-R at a moderate speed to maximize universal playability. We can convert your material from the following sources: Beta-SP, 3/4", DVCam, mini-DV, DVD, S-VHS, Hi-8, VHS and Betamax to mini-DV or DVD to facilitate archiving and digital editing requirements. Clients who require the taping of an audition piece in a controlled environment can quickly get a scene professionally shot and assembled to be uploaded and emailed to their representatives or casting the same day. Our staff will light, frame and shoot the scene, read lines if required and assemble the best takes. Our service is regularly used by busy industry professionals and has been recommended by one of the largest casting offices in New York. To best serve the needs of our entertainment clientele and because time is often a critical factor, we offer the convenience of a direct messenger service. Delivery to industry locations can often happen the same day for a nominal fee. Most of our clients are busy professionals who appreciate the affordable convenience of this delivery option. For small agency and management offices, it's like having a personal assistant hand-deliver their time-sensitive submissions. Carey-it-Off Productions (the production side) is a Telly award-winner in the area of film/video production. We can write, develop, produce, shoot, edit, duplicate, distribute infomercials, industrials, long-form entertainment content and news/entertainment segments. We can shoot the Red Carpet or take a project on a walk down the red carpet, it all depends upon the client's needs. Single camera -- multi-camera, mini-DV to HD, 24p for filmout to film ... if you need to communicate or create film or video content you need to talk to us. We can provide quality encoding and compression suitable for website use or as data files for playback on your desktop computer. We use the latest compression tools to deliver files in all of the popular formats. We can also assist our clients to post video to services such as iActor and Actors Access. One-day turnaround. We have many agents and managers who enjoy preferential and customized services for their clients. Our ability to respond quickly to unique casting opportunities allows agents and managers who use our services to have a competitive edge. As an example, Friday afternoon a manager needs a custom demo for their client who is up for recasting in a network series. Our ability to complete the work and deliver copies to the network before the end of the day allowed the client to book the job. Today that same service can be delivered through The Custom Reel. This successful action has been repeated many times for managers who understand the powerful asset we can be to their business. We maintain on-site masters of every edited demo so that we can quickly respond to requests for duplication or tailor a winning, customized demo tape for each situation. All this, coupled with our on-site messenger, enables us to respond quickly to the demands of the entertainment industry.